This item is out of stock and will be made specially for you. 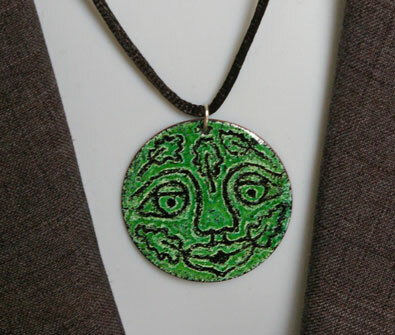 "My Green Man Pendant is about 4cm in diameter, and has an image of the ancient green man symbol. Naturally, I only enamel this pendant mainly in green, however the face and other details on each pendant are never exactly the same, as they are all hand-drawn in the final layer of enamel powder before being fired in the kiln. 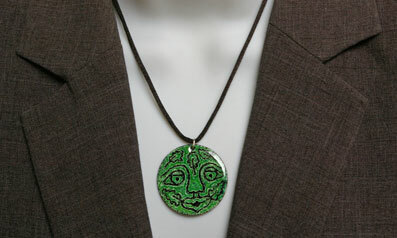 Presented in a gift box, the Green Man Pendant hangs on a black necklace cord with a silver-plated fastener. A choice of cord lengths is available."